The Burton Union System is a wood barrel fermentation system that was used predominately by the brewers in and around Burton-on-Trent, England, in the mid- to late 19th century. It is also referred as a “Union set.” Among the notable brewers who employed this system are Bass Brewery and Marston’s Brewery. Marston’s is the last brewery in England who still utilizes this system. A Union set is an amazing and strange brewing anomaly, consisting of large wood barrel casks, each 150 imperial gallons in size (about 7 hl), ranging from 24 to 60 in number, which are positioned on their sides in rows, typically suspended off the floor in a wood or metal frame by large metal axles. The barrels are spaced evenly and each is fitted with a bottom valve that leads to a bottom trough. An attemperator cooling coil is installed in each barrel to control fermentation temperature with chilled water. The barrels are linked together by a series of side rod pipes so that liquid can be evenly dispersed throughout the Union from a feeder vessel. A swan neck pipe leads from the top of each the barrel to a top trough, which is suspended over the barrels and is slightly pitched to one end. Connected to this trough, at the lower end, is the feeder trough. The Union is fed by gravity from the primary fermentation vessels, or squares, with fresh, actively fermenting ale wort, typically 12–24 hours after yeast has been added. At this time in the fermentation process the yeast is very active. The fermenting wort is introduced to the system at the feeder vessel and flows into the barrels through the side rods, flooding the Union. As the yeast ferments, it is forced out of the barrels in foamy bursts, along with some beer, through the swan necks, and into the top trough. Here some of the yeast stays behind while the beer runs down the trough, into the feeder vessel, and back into the casks through the side rods. As the fermentation proceeds, a large amount of healthy, viable yeast is retained in the top trough and the beer in the barrels, now cleansed of its yeast, gradually becomes bright. The yeast is collected from the top trough for subsequent fermentations and is considered of very high quality. After about 6 days in the union, the fully fermented beer can be dropped out of the barrels through the bottom valve and collected in the bottom trough. This beer is then moved to a finishing vessel, blended with other beer, or packaged in casks. Although the Burton Union system is spectacularly ungainly, it is also oddly beautiful. 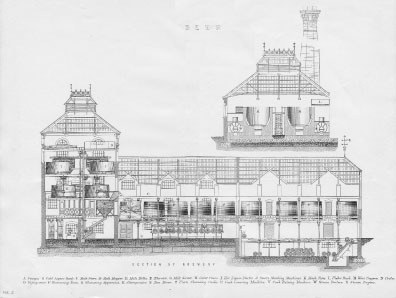 At the height of the system’s use in the 1800s, a large brewery <?Insert-Figure ID="acref-9780195367133-figureGroup-002020">such as Bass would have employed dozens of Union sets, each of them capable of fermenting over 300 hl (256 US bbl) of beer at a time. The oak was never used for flavoring the beer, and today the brewers at Marston’s also prefer maintaining older neutral barrels and do not select wood based on the flavor that it will impart. Like brewers 150 years ago, they are interested instead in the quality of the yeast and the character of the fermentation that the system produces because of its unique design and materials. The Union system is very labor and capitol intensive to employ and requires constant maintenance by an experienced cooper. Cleaning is difficult and is conducted with large amounts of hot water and manual labor; modern cleaning chemicals and automated cleaning systems cannot be used with wood. This has resulted in the Union process being largely abandoned by British brewers, Bass having discontinued the use of Burton Unions in the 1980s. Today, Marston’s uses the Union largely for the production of their flagship Pedigree Bitter. Firestone Walker Brewing Company in Paso Robles, California, utilizes a modified Burton Union fermentation system (Firestone Union, US Patent 1996) and is the only brewery in the world beside Marston’s who is recognized as operating a union set today. The union set is used to produce the brewery’s flagship Double Barrel Ale, Walker’s Reserve Porter, and Pale 31 beers. Their system does not utilize an elaborate system of swan necks and troughs but rather uses flexible hose and smaller receiving buckets. It consists of new American oak barrels, 227 l (60 US gal) in size, which are toasted inside similar to winemaker’s barrels and impart wood flavor to the beer. Firestone Walker’s system is not utilized to collect yeast; however, the unique geometry of the system along with the new American oak barrels has a profound effect on the flavor of the beer. In the Firestone process, 24-hour-old fermenting wort is delivered to the individual barrels utilizing a racking cane. The wort is then allowed to ferment without any temperature control in a series <?Insert-Figure ID="acref-9780195367133-figureGroup-002021">of barrels ranging from 32 to 48 in number. 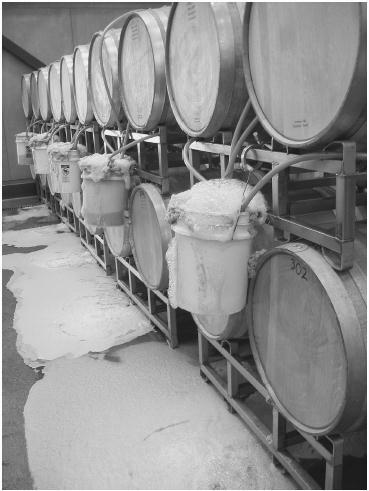 As the beer ferments, brown yeast and foam are pushed from the barrels to a bram back or receiving bucket, and the cast-off foam is discarded. The finished beer has a notable soft and fruity character with a pronounced oaky, vanilla note compared with beer simply fermented in stainless-steel vessels. Chris, Boulton, and Quain David. Brewing yeast and fermentation. Boston: Blackwell Science Ltd, 2001.